Pilgrims pray inside the church. 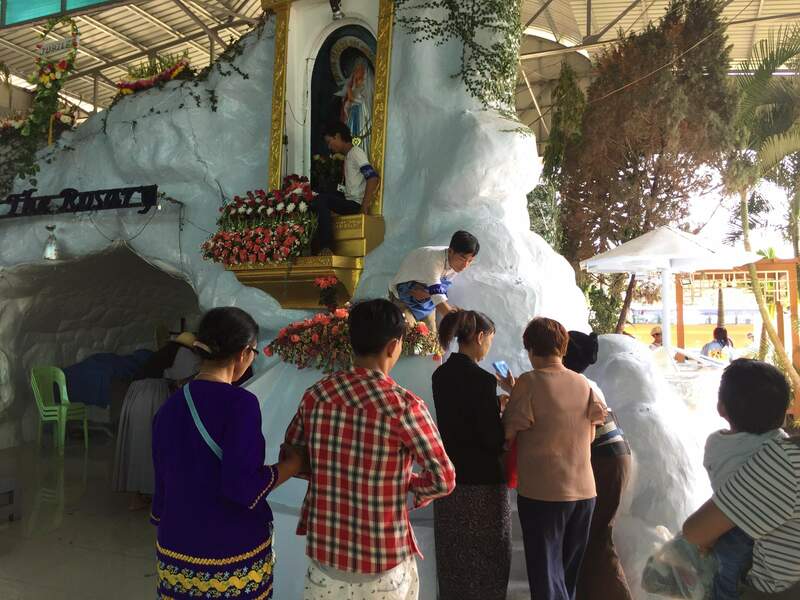 NYAUNG LAY PIN – The Church of Our Lady of Lourdes compound in Nyaung Lay Pin, Pegu Division, about 70 miles north of Yangon, has been abuzz with Catholic pilgrims from parts near and far for days. 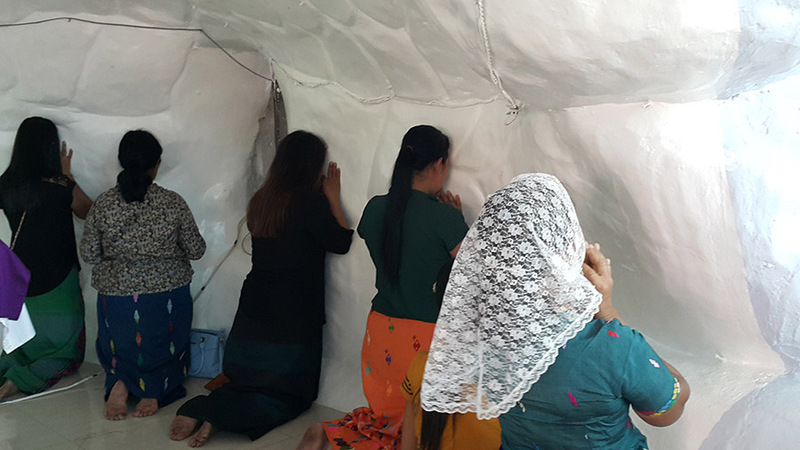 Those who had traveled a long way clutched suitcases and backpacks as they were shown to a line of temporary bamboo tents inside the church compound. In preparation for the Mass, nuns and laymen bustled about with flowers, decorating the grotto that enshrines the replica of the statue of Our Lady of Lourdes. Pilgrims prayed before the shrine or under the grotto, while some drank and collected holy water from the small well nearby. Two young men helped small children reach the statue of Our Lady of Lourdes as their parents looked on, eager for them to touch the statue to receive its blessings. The two young men were kept busy, helping pilgrims who handed over their rosaries, small statues of the Virgin Mary, images of the Infant Jesus and St. Joseph, and bottles of olive oil and holy water to touch the statue with; they believe doing so will make these into holy things with the power to offer protection. The replica statue of Our Lady of Lourdes is readied for the procession. Pilgrims to the Church of Our Lady of Lourdes believe that praying the rosary, worshipping, drinking and washing with holy water, and receiving blessings by touching the statue, can heal illness and prevent disease. Back in 1892, when French Catholic missionaries arrived in the country, Father Michael Mignot settled down in Nyaung Lay Pin, bringing with him a replica statue of Our Lady of Lourdes. He spread the story of the Marian Apparitions — a reported supernatural appearance by the Virgin Mary — believed to have occurred in Lourdes, France, in 1858. Pilgrims pray in front of the grotto. In 1929, a mentally unstable man toppled the statue from its perch in the grotto. It was smashed to bits and a replacement was put in. In 1942, Japanese troops occupied Nyaung Lay Pin and used the church compound as their headquarters. They too toppled the statue, causing the hands to snap off. In 1949, the hands were reattached; the cracks can still be seen to this day. The first procession of Our Lady of Lourdes, in which the statue was carried along a circular route around the town, was held in 1930 to promote the Catholic mission and commemorate the two reported Marian Apparitions in Lourdes, on Feb. 10 and 12, 1858. Since then, a procession has been held annually on Feb. 10-12. 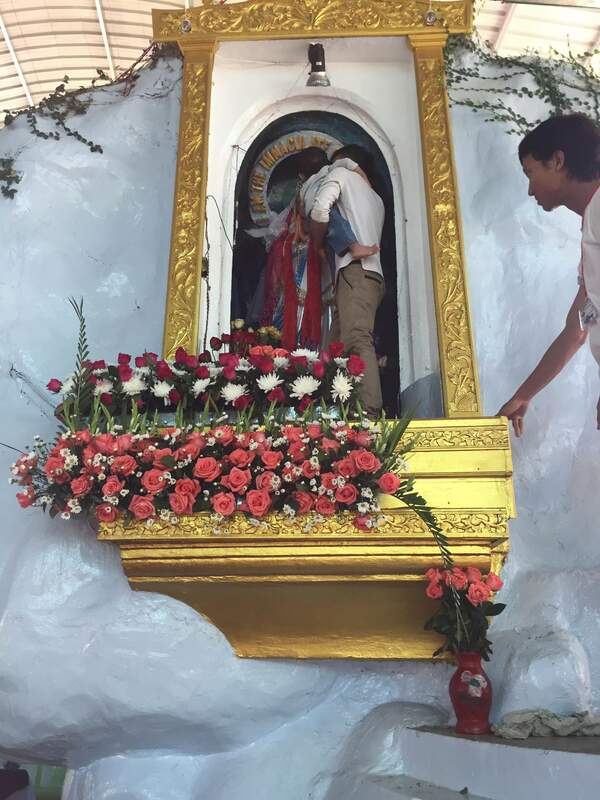 Beneath the grotto, pilgrims pray to the Virgin Mary for good health. In recent years, the three-day celebration and Mass have been extended into a more-than-weeklong event from Feb. 2-11, with a healing Mass and procession on Feb. 10. This year, Cardinal Charles Bo will lead the special Mass on Feb. 10, after the procession. 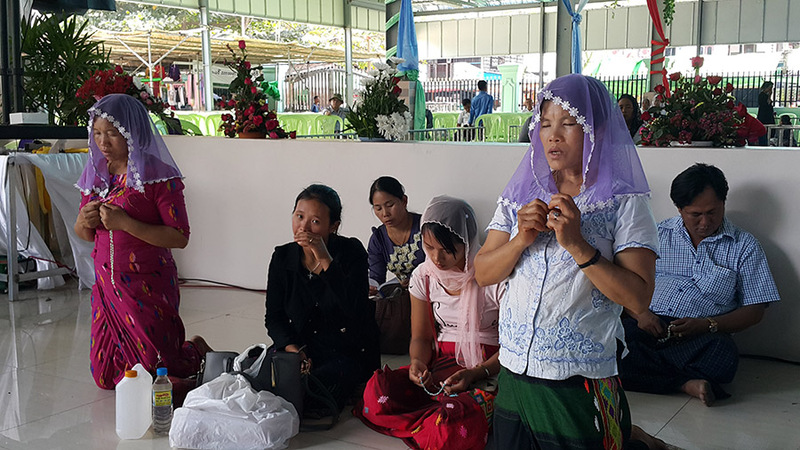 “Since we are not able to go Lourdes, the mass here in Nyaung Lay Pin is the only hope we have of witnessing Mother Mary’s miracles,” said Daw Khin Kyi, 56, a cancer survivor from Hmawbi Township. Daw Khin Kyi said she was diagnosed with breast cancer two years ago. However, she believed that Our Lady of Lourdes had answered her prayers and healed her. A child is presented to touch the statue. Pilgrims believe doing so bestows blessings. “By the grace of Our Lady of Lourdes, I was healed and received enough money to buy medicine,” she said. Apart from thousands of Catholics and other Christians, non-Christians also visit Nayung Lay Pin during the Holy Mass and celebration to pray for their health. Many of them were seen bringing their children to the grotto to touch the statue. Pilgrims line up and wait for their turn to hand over objects to touch the statue. 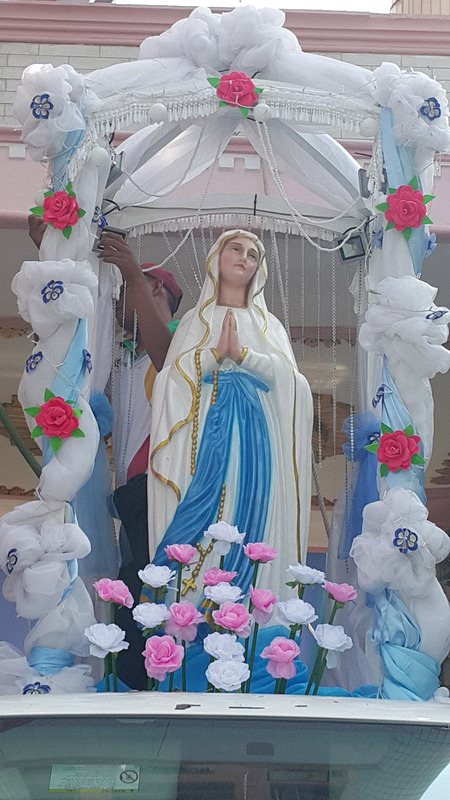 Although the majority of the population of Nayung Lay Pin is Buddhist, the local authorities and population seem to approve of the procession of the statue of Our Lady of Lourdes. “Most of the locals love the procession, as they also believe Mother Mary is protecting them. We’ve never experienced any anger or disapproval; every celebration has gone peacefully,” said U Saw Simon, 65, an elder of Nyaung Lay Pin.